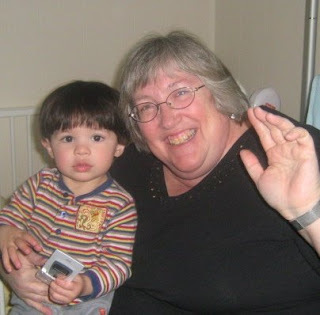 Did I fail to tell you about and show you my last days with my grandson and family in Vancouver? So sorry! 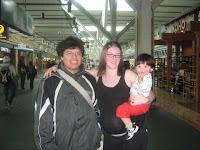 It was wonderful to see Alejandro and to spend even a brief time with my daughter, who is expecting again in August. (Hallelujah!) 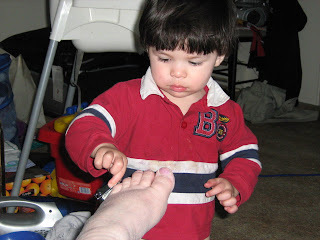 Alejandro is at the stage where he only ever wants Mommy and Marah is rising to the challenge,while Dan is being a very patient husband and father. . At one point in my visit, Alejandro decided that Grandma needed a pedicure and tried to clip my nails. He is such an interesting darling! I also, before I left Toronto, had some special meals with special people. One evening I took Ben out for his April 8 birthday and I did the same for Marah in Van for her April 7 birthday! 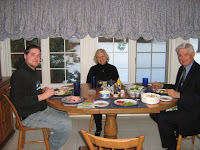 Below on the left is Harold, Heather and my son Ben, whom I had for supper at my (temporary) home one evening. 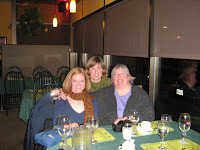 On the right, you can see me with Karen & Kathy at the Moldova restaurant in Toronto! Mamaliga - yum! Posted by Barb at 12:52 a.m.